Sea lions, seals and walruses are marine mammals belonging to an order, or group, called pinnipeds, which means fin-footed or wing-footed. Sea lions are vertebrates with both backbones and ribs. 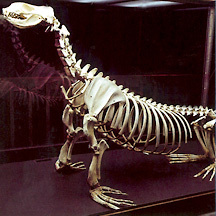 The backbone is a gliding joint, allowing the animal to be flexible, while the ribs main function is to protect its inner organs. The short tail helps to balance the animal while walking on land. Sea lions have the same bone structure in their fore-flippers as humans have in hands, though theirs are modified for swimming. They also have five fingers in their hind flippers and they even have three toenails. Sea lions can rotate their hind flippers under their body, allowing them to stand on all four limbs. Using both their fore flippers and hind flippers, they are able to walk on land. In the water the Steller sea lion pulls itself through the water using its powerful front flippers. They reach speeds of 17 m.p.h. Other marine animals such as seals, swim with their hind flippers using a body action that is more fishlike. 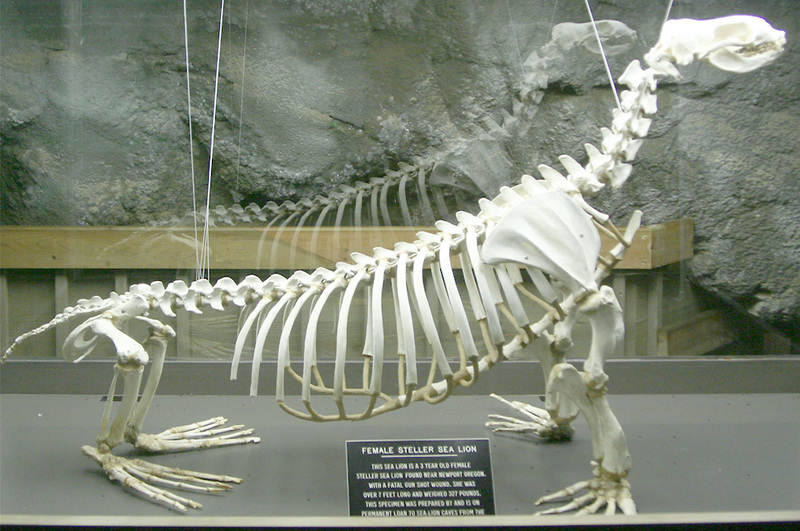 The encased specimen on display at Sea Lion Caves was prepared and is on permanent loan from Hatfield Marine Science Center in Newport, Oregon. The animal is belonged to was a 3-year-old female Steller Sea Lion, found near Newport, Oregon with a fatal gun shot wound. She was over 7 feet long and weighed 327 pounds.